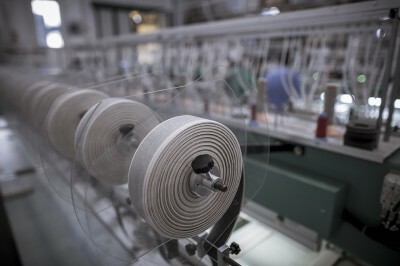 Victor has been producing fabric ribbon for almost 70 years. The company’s success can be seen from its growing number of customers, both in Italy and abroad, including fashion houses such as Hugo Boss. The story began in 1945, when Vittorio Rossi Luciani opened a small textiles workshop supplying local tailors and haberdashers. A passion based on the understanding of the additional value that a tape can represent, especially for the haute couture industry. The company benefitted significantly from the feminine touch when Regina Bertipaglia, Vittorio’s young daughter-in-law, took over the management role at Victor, breathing new life into its activities thanks to her intuition and insight. The handover between the generations brought a wind of change, and over the next three decades the company became a leader in the field of tapes for clothing, investing in human resources and technological innovation. The strength of Victor lies in a successful combination of tradition and innovation, the ability to apply traditional styles to the requirements of today’s textile industry. Visit the site to order a copy of our catalog. Please feel free to contact us for any further information about fabric ribbon.